This past Saturday, we celebrated Cora's 3rd birthday with a neighborhood block-party type party for her. We didn't want to go too crazy with planning an elaborate party for her, so we held the party in our alley way. To explain further, we live in a town home community where the garages/driveways back up to our neighbors, and since there isn't a good grassy area in the neighborhood for the kids to play in, we've adopted the alley way as a place where our kids all play together while us adults hang out and enjoy a beer or two. And because Cora wanted to invite all of our neighbors' kids, it just made perfect sense to keep it in the alley, making it easy for me and Steve in terms of choosing a venue. We had about 25 adults that needed to be fed so we thought catering was the way to go and I am SO glad we did. Giolitti's, a local Annapolis Italian deli & market, did a fantastic job providing gourmet sandwiches, cookies, & cannolis for the adults. And Chick-fil-a's chicken nuggets and fruit salad were what the kids wanted. Since I didn't cook anything for the party, I felt this strong urge to bake something. I mean, I had too. It's my baby girl's birthday, I couldn't just not make something for it. Well, she specifically requested flower cupcakes so I said I would make them. Normally, I use Ina Garten's recipes for almost everything when it comes to making something for company coming over. But I wasn't really liking some of the reviews on her vanilla cupcake recipe (not the coconut one, that one is amazing!). So then I got to thinking, who makes cupcakes that I absolutely love and wish I could get for her party? Georgetown Cupcakes! But seeing as how the shipping costs alone would probably be more than the actual cupcakes themselves, I decided that was not going to happen. 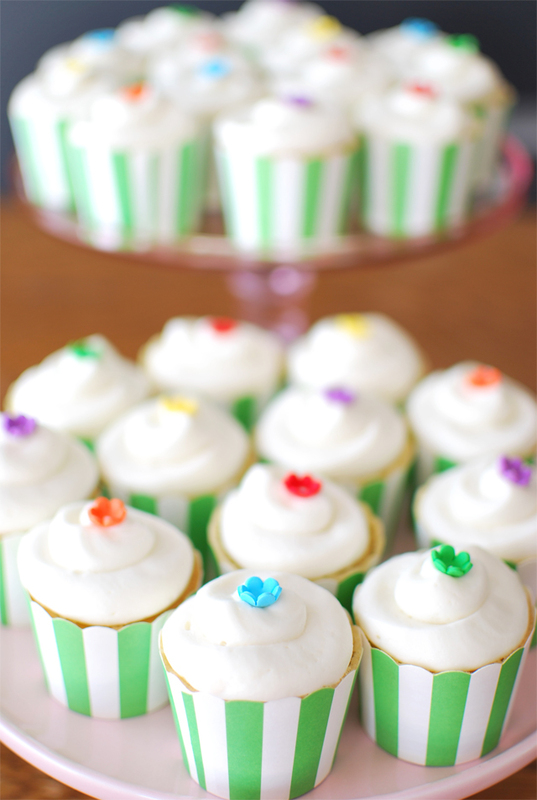 Buuut, I was able to find their recipe for vanilla cupcakes with cream cheese frosting! It was perfect and the recipe itself seemed simple enough for me to make. 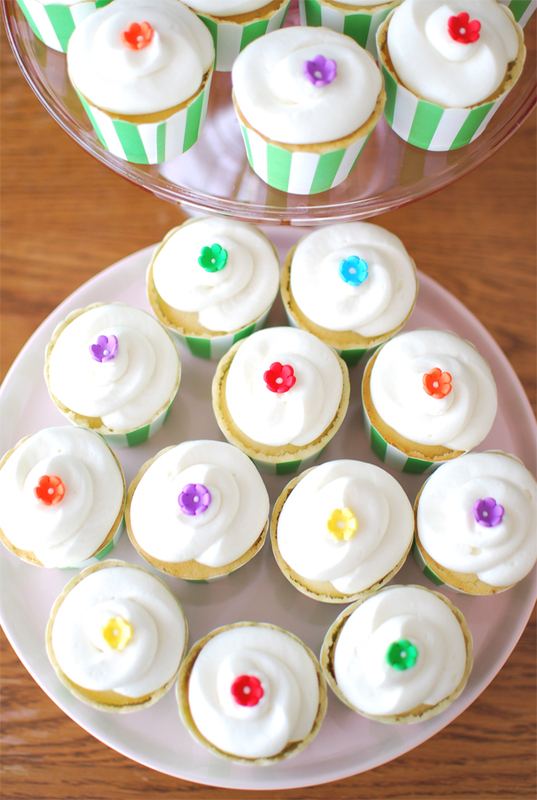 I cannot tell you how easy it was to make these cupcakes and they turned out dangerously delicious! Normally, I'm not a huge fan of cream cheese frosting, but I was literally eating the frosting out of the piping bag! I found the recipe at Get Sweet Smart and highly recommend it. 1. Preheat oven to 350 degrees. Line two muffin tins with cupcake wrappers. 2. In a small bowl, sift flour, baking powder and salt together. 3. In the bowl of a stand mixer, cream butter and sugar together for 3-5 minutes or until light and fluffy. Slowly add eggs one at a time until combined. 4. Add vanilla and vanilla bean seeds to milk. 5. Add 1/3 of the dry ingredients to the egg mixture and beat with stand mixer until well combined. Add 1/3 of the milk and mix thoroughly. Repeat with remaining ingredients, scraping bowl as needed. 6.Pour batter into prepared pans and bake for 16 to 18 minutes or until a toothpick inserted into the center of a cupcake comes out clean. Cool pans completely on a wire rack. 1. In the bowl of a stand mixer with the paddle attachment, beat all ingredients on high speed until light and fluffy, at least three minutes. 2. 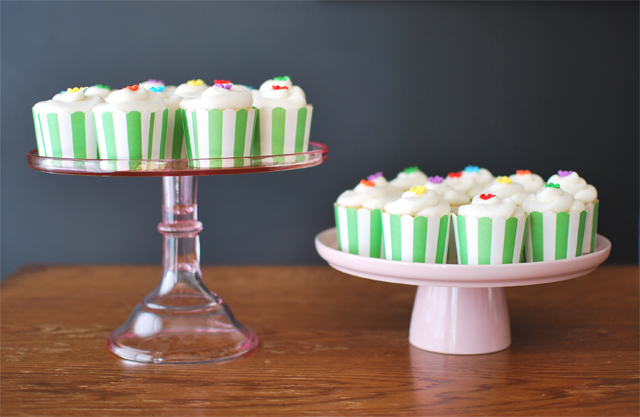 Pipe onto cupcakes using a pastry bag fitted with a large round tip. (I used a large freezer Ziploc bag instead of a pastry bag and it worked just as well). The flower decorations are from Michael's and the cupcake liners are from TJ.Maxx. I believe the cupcake liners are made by a company called Meri Meri. How adorable are these goodie bags that I found at Marshalls? 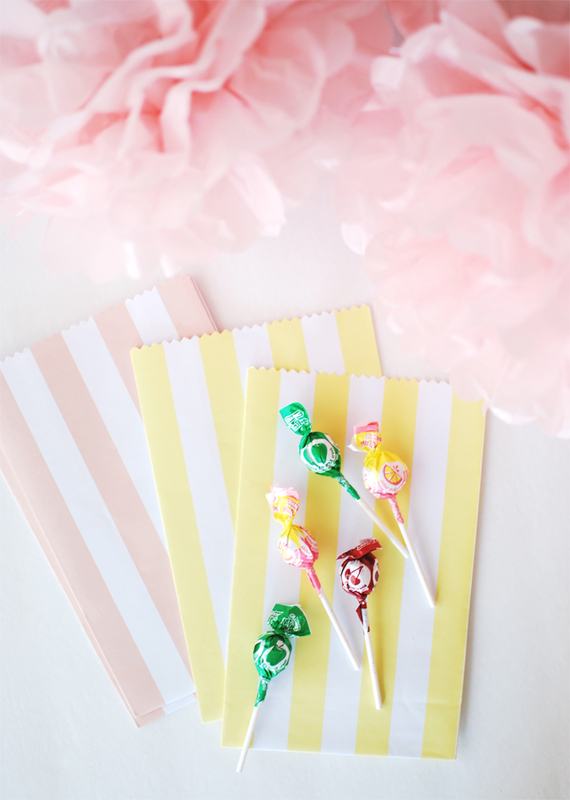 They were perfect in color and pattern for her flower-themed party.